Iran has recently showcased its newest air defense missile system, Bavar-373, which features characteristics similar to Russia’s S-300, immediately prompting speculations that it is an answer to and a substitute to Russia’s systems, which have yet to be delivered to Tehran under an existing contract. 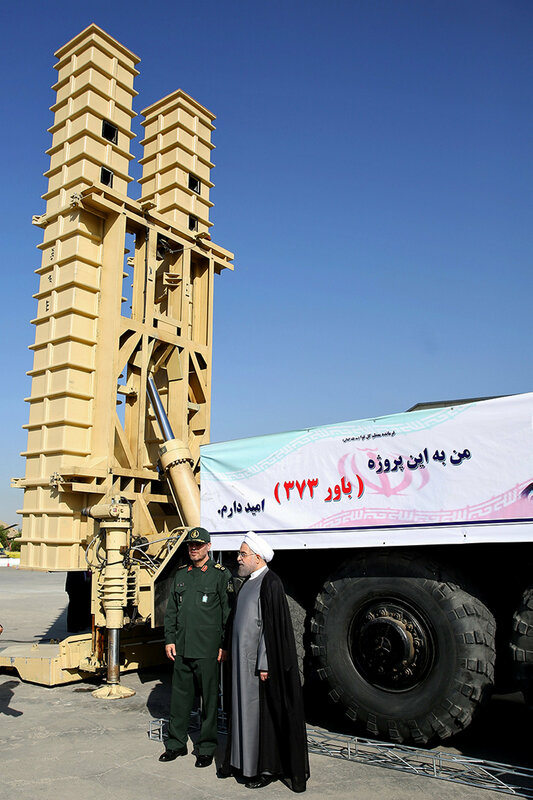 On Sunday Iranian President Hassan Rouhani unveiled the country’s long-awaited, domestically-built Bavar-373 surface-to-air missile (SAM) defense system. The home-grown system, which was successfully test-fired in August 2014, is similar to the Russian S-300 and is capable of hitting high altitude targets. On Monday, the country’s Defense Minister Hossein Dehghan announced that Tehran is set to begin the mass production of its Bavar-373 air defense system once the practical tests that are expected to continue until March 2017 have been completed. All the above has sparked speculations that the system is an answer to and a substitute to Russia’s systems, which have yet to be delivered to Tehran under an existing contract. Mahmud Shoori, Director of Eurasia Research Group at the Center for Strategic Research (CSR), a leading Iranian think tank, has commented to Sputnik on the issue. Technologically, he said, it is quite hard to distinguish what the two systems, Russia’s S-300 and its Iranian analogue, the Bavar-373, have in common or how they differ from each other, and if they could be used simultaneously for similar purposes or not. However what is more important here is that the domestic development of such a system underscores that the policy of Iran’s military defense industry is aimed at satisfying all of its military needs independently and on its own, to the extent it is possible. He said Tehran is particularly interested in independently ensuring the Islamic Republic’s strategic goals, one of which is the defense of its borders. Throughout its existence, the expert stressed, Iran has never relied on the support of other states but only on its own capabilities. However, he noted, Iran’s military defense complex needs an inflow of the most advanced foreign ideas and technology and operationally ready military equipment to ensure the gradual development of its military defense industry and that it is able to comply with the needs of the time. That is why the country had signed an agreement with Russia on the delivery of its S-300 air defense systems. “On the whole, I don’t see any problems for Iran continuing its purchase of Russian S-300 under the existing contract, while simultaneously developing and showcasing the achievements of its military defense industry,” Mahmud Shoori told Sputnik. The top priority for Iran’s military defense complex is to maximize the independent production of its own strategic armament, he explained. The expert, however, noted that the two systems significantly differ in quality and functionality; however, they could supplement each other.It remains to be seen how they will be used in combat – separately or together. Back in 2007 Moscow and Tehran signed an agreement for the delivery of five battalion sets of Russian S-300 PMU1 air defense missile systems. In 2010 Russia halted the deliveries due to a United Nations Security Council resolution imposing sanctions — which included a ban on the sale of high-tech weapons. After the cancellation of the arms deal, Iran demanded $4 billion in compensation from the Russian state. In April 2015, after an interim agreement that paved the way for July’s full nuclear deal was signed President Putin lifted that self-imposed ban. Russia has already delivered the first battalion of S-300PMU-1/SA-20 Gargoyle SAM batteries to Iran. The S-300 is a long-range SAM system, and can engage aircraft, cruise missiles and theater ballistic missiles. One S-300 battery usually consists of an engagement radar, a low-altitude radar, and up to eight transporter erector launchers (TEL) with four launch tubes each.Each tube carries one surface-to-air missile. A battalion comprises up to six batteries in addition to a command/fire and control post, as well as an extra target acquisition radar unit. During Iran’s annual National Day Parade in April, the Iranian military displayed a S-300 target acquisition radar unit, a radar station and a mobile radio antenna. However, no TELs or missiles were displayed. The S-300 SAMs currently being delivered are an upgraded version of the weapons systems initially ordered by Iran in 2010. In July 2015, Russian Presidential Aide for military-technical cooperation Vladimir Kozhin announced that Russia would update the S-300 SAMs to meet specific Iranian needs, but didn’t offer any technical details. Kozhin recently said that Russia will complete the delivery of S-300 air defense systems to Iran by the end of the year. Mahmud Shoori gave a positive forecast for continuation of military-technical cooperation between Russia and Iran. “As far as I know, our defense minister has said that Iran has currently no need for an agreement on the delivery of the advanced missile defense systems. What we already have in service and what is now being delivered by Russia is enough to satisfy the demands of our defense industry,” he told Sputnik.However, he added, the military industry does not stand still and is developing. It is highly possible that Iran is going to face new geopolitical challenges in the near future and thus will have new defense needs. Political conditions will then dictate what Russian military technology will be of interest to Iran. “I personally think that the military-technical cooperation between our countries is certain to continue,” he said. “However the subject of our deals will depend on a number of factors including the further development of bilateral relations between Russia and Iran,” he added. Iran’s Defense Minister Hossein Dehghan stated that various components of the Iranian Bavar-373 long-range air defense systems had already been tested and the system had been transferred to a launch site for further tests. Iran is set to begin the mass production of its Bavar-373 air defense system once the practical tests that are expected to continue until March 2017 have been completed, local media reported, citing the country’s Defense Minister Hossein Dehghan.The tests include intercepting ballistic missiles, Dehghan was as quoted as saying on Sunday by the Tasnim news agency. He said that various components of the Iranian Bavar-373 long-range air defense systems had already been tested and the system had been transferred to a launch site for further tests. On Sunday, Iranian President Hassan Rouhani unveiled the country’s long-awaited air defense missile system with characteristics similar to the Russian S-300.In May, Dehghan announced that Iran had completed development of the domestically-produced Bavar-373 air defense system, with mass production expected to begin later in 2016.